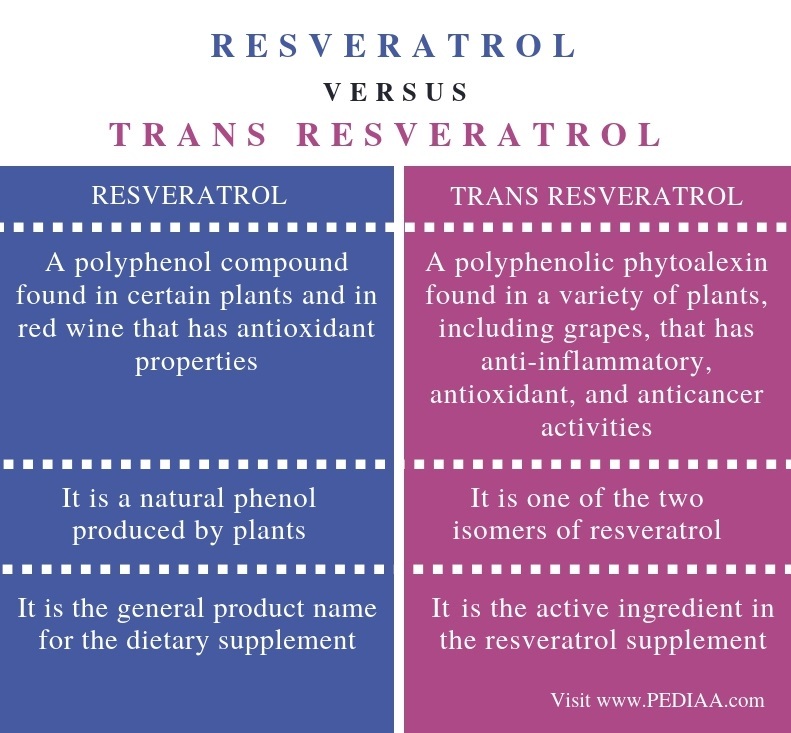 The main difference between resveratrol and trans resveratrol is that the resveratrol is the general product name of a dietary supplement containing polyphenols, which act as antioxidants, whereas trans-resveratrol is the active ingredient found in the resveratrol supplement. Furthermore, resveratrol can come in different levels of purity while pure trans-resveratrol contains 99% of the active ingredient, trans-resveratrol. Resveratrol and trans-resveratrol are two names used to describe a type of natural phenols produced by certain plants in response to injury or pathogenic attack. The two principal isomers are the cis and trans resveratrol. 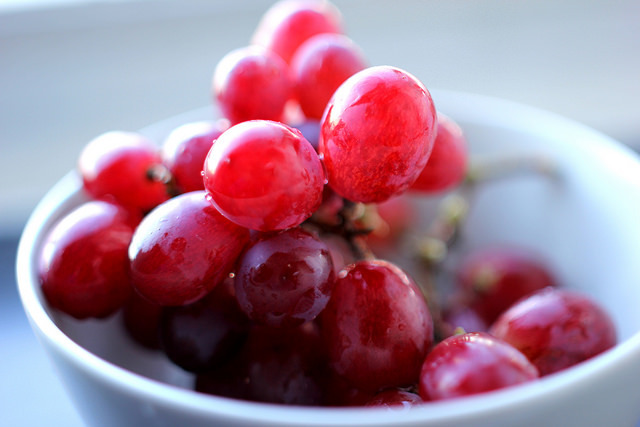 Resveratrol is a type of natural phenol and a phytoalexin produced by several plants including red grapes, peanuts, and berries in response to injury or attack by pathogens. Due to the antioxidant antimicrobial, and anticancer properties of this compound, it is used as a dietary supplement. Also, the two geometric isoforms of resveratrol are cis-resveratrol and trans-resveratrol. Due to the structural properties, trans-resveratrol is the form of resveratrol associated with potential health effects. Moreover, a belief is that the resveratrol has potential health effects against heart disease and cancer. Evidence suggests that resveratrol can reduce systolic blood pressure. Also, another thought is that the low incidence of heart diseases among French in contrast to their high-fat diet is due to the consumption of red wine rich in trans-resveratrol along with the other dietary polyphenols. S. Renaud, in the early 1990s, introduced this situation as ‘French Paradox’. Besides, the moderate consumption of red wine can lower the rates of common cancer types including breast cancer and prostate cancer. Trans-resveratrol is one of the two geometric isomers of resveratrol. Due to its structural properties, it is the active ingredient of resveratrol supplements with potential health effects. Trans-resveratrol has a planar backbone while cis-resveratrol contains two major planes. However, resveratrol supplements may contain variable amounts of trans-resveratrol, the active ingredient. Since it is a dietary supplement, the label of the product does not contain the exact percentage of trans-resveratrol in terms of purity based on the regulations of the FDA. Therefore, it is always good to buy a form of pure trans-resveratrol, which has a 99% purity. Furthermore, pure trans-resveratrol comes with a number of health benefits as mentioned above. Some of its other benefits are reducing the incidence of liver disease, joint disease, Alzheimer’s disease, Parkinson’s disease, multiple sclerosis, atherosclerosis, macular degeneration, and cataracts. Resveratrol and trans-resveratrol are two forms of compounds naturally produced by certain plants including peanuts and red grapes. Dietary supplements include both these compounds. Moreover, they serve as antioxidants, protecting the body against oxidative damage. Besides, they may have potential health effects against heart disease and cancer. Resveratrol refers to a polyphenol compound with antioxidant properties found in certain plants and red wine while trans-resveratrol refers to a polyphenolic phytoalexin found in a variety of plants, having grapes, that has anti-inflammatory, antioxidant, and anticancer activities. Thus, this is the main difference between resveratrol and trans resveratrol. Moreover, while resveratrol is a natural phenol produced by plants, trans resveratrol is one of the two isomers of resveratrol. Resveratrol is the general product name for dietary supplement while trans resveratrol is the active ingredient in the resveratrol supplement. Hence, this is another difference between resveratrol and trans resveratrol. In brief, resveratrol is a natural phenolic compound produced by certain plants. It occurs in two isomers: cis resveratrol and trans-resveratrol. Furthermore, resveratrol comes as dietary supplements due to its potential health effects including antioxidant and anticancer properties. However, trans-resveratrol is the active ingredient in such dietary supplements. Therefore, the main difference between resveratrol and trans resveratrol is their structural and functional correspondence.